This kit contains the basic supplies which will enable you to maintain and clean your optics, from dust and prints to back-splattered debris to minimize the absorption and excessive heat load, thus prolonging their lifetime. 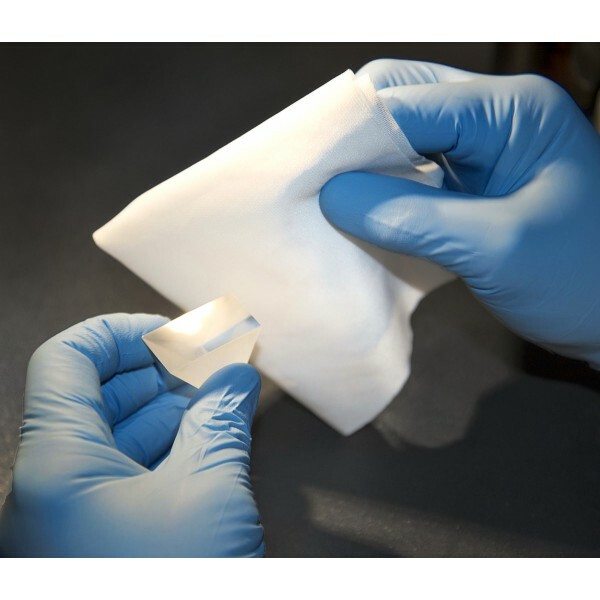 New; we add a Cleanroom Laundered Polyester Knit Wiper to the kit; This 23x23 cm tissue, compatible with acetone and other solvents, is excellent for optics wiping. This cleaning kit was developed specifically for Laser Optics. Laser Optics typically may have thin-film coatings applied to their surfaces that can be scratched and damaged. Therefore, cleaning must be done properly with solvents containing Laboratory Grade Alcohol or Acetone with >99.9% purity and no water content. This cleaning kit is suitable for any optics cleaning, both in laboratories and industrial environments. Now commonplace in industry, lasers routinely cut and burn plastics, wood, metals and other materials. These expensive optics need protection from the airborne industrial destructive splatter that they are often subjected to. This kit contains the basic supplies which will enable you to maintain and clean your optics, from finger prints to fumes and back-splattered debris to minimize the absorption and excessive heat load, thus prolonging their lifetime.